“Sir, if I can give you any help please ask”. Alamo Golf Society played Desert Springs Golf Course on Sunday 24th March. Upon arrival we were greeted by the gentleman who does the buggies and it was a pleasure to hear welcome to Desert Springs “Sir if I can give you any help please ask”. Went into the Club House and the 2 ladies on reception where an absolute pleasure to deal with. Met yourself and I have to say you are an absolute gentleman to deal with and speak to. All our members met in the club house which was really nice with a great atmosphere and a beautiful big log fire burning. Service was top notch and a number of our members sampled the fair from the kitchen. Each and every member who dined said the food was excellent and would recommend eating there to anyone. The course was really well laid out and a true challenge to play. No 2 holes where the same and it was nice to play on a course where you do not play driver off all the par 4’s and par 5’s. A real thinkers course plays pretty difficult but a very fair challenge of golf. Par 3’s where all different and if you landed the ball in the right place you have a good chance of a 2. Greens where really fast but also very true. I have to say that I and all of our members really look forward to playing Desert Springs again in the very near future. 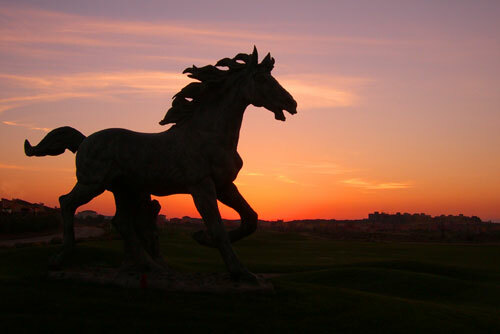 I would recommend Desert springs to any Golfer for the Golf, service, and all-round experience. Massive thanks again to you and your team for organising and delivering the event seamlessly for our large group. “We visited in March for a cricket tour. As we were short of numbers the Desert Springs team pulled out all the stops to ensure we had 11 players and a well matched opposition. The ground is very, very good, built to international standards and is like an oasis in the middle of the desert. The golf course is stunning and the food outstanding. Accommodation is modern, clean and spacious. “Once again we played Desert Springs with friends and family. Malcolm arranged our visit and organised everything effortlessly. We can’t wait to re-visit with our work and social colleagues. The course is both challenging and very easy on the eye. The greens are amazing, and the layout demands constant concentration. The restaurant staff were very professional and attentive. The food was delightful and represented very good value for money. Malcolm the Golf Manager arranged everything without any fuss or complaints. He made our trip so uncomplicated and seamless. My husband and I have stayed and played at Desert Springs numerous times, it’s always a pleasurable experience. Not very different this time, we are on a 2-week golfing holiday. The main difference this time is, the course is less crowded, and the staff are happy to adjust your tee time to your needs. The food in the clubhouse is exceptionally good and value for money. The staff are welcoming and friendly. Subject: A New Year’s Eve to remember! Another wonderful New Year’s Eve party put on by Ellie and her team. Immaculately organised, super food, wines and music. Count us in for next year again. Fantastic venue for a special day. The food was outstanding with attention to detail using quality ingredients. The staff were attentive without being ‘in your face’. Well done Ellie for the organisation and planning – save us a place for next Christmas! My husband and I spent Christmas Day here with good friends. The service from Elle, Xavier, Pilar, Ignacio and Yala, together with Chef, was exemplary! The food utterly sensational and plentiful. I doubt either of us finished it. Utterly delicious. A lovely atmosphere, beautiful Christmas tree and decorations and very quaffable red wine made our Christmas lunch complete. I have to say we are all in agreement that it’s probably one of THE best Christmas lunches we have ever eaten. We have enjoyed many wonderful meals at the El Torrente but on this occasion, we visited the Christmas Market and Santa’s Grotto. On arrival at the entrance to El Torrente there was a variety of stalls selling a great selection of Christmas gifts making everywhere look very festive. It was lovely to watch so many little children excited to see Santa Claus who obviously had a very busy evening with the aid of his Elf. I’m used to eating at Spanish golf restaurants and they are often very bad. This one is very good though. The Indian chicken korma is amazing. The self-catering accommodation was lovely, with a good-sized pool right outside our door. We enjoyed the continental breakfast every morning and ate at the excellent restaurant every night where the food was very good and reasonably priced. The golf manager Malcolm arranged all our tee times at Desert Springs and two other nearby courses and generally set up everything perfectly for us. A very enjoyable and relaxing trip. Arrived on a hot sunny afternoon to find a lovely clubhouse and a superb looking course. We were seen straight away at reception where two girls took us through all the ins and outs of the resort. Taken to “the lodge” for our accommodation which was far superior to what we were expecting. A lovely apartment on the ground floor spotlessly clean with a nice fully equipped kitchen. I’m a chef and like to cook on holiday with locally sourced products and the kitchen was set up with everything I needed. We ate in the clubhouse the first evening after having drinks on the patio. The barman made me a fabulous gin and tonic whilst giving me a lesson in how to pour the tonic to maintain the fizz. Loved it!!! Food was fab and we went to bed very chilled out and relaxed. Both my husband and I are single figure handicappers and found the course in great nick with a good degree of difficulty. Well maintained greens and lovely little touches like signage and sculptures dotted around. Don’t even think twice. Just go ahead and book this resort for your holiday. We certainly can’t wait to go back. PS there’s loads to explore in the area. I wish to express my grateful thanks and appreciation to you and your first-class Desert Springs team for your most generous hosting, through Nick, of Tom and myself over the past few days. The trip was most illuminating and a fine insight into all the excellence on offer. Your setting, provision, facilities and staffing were all superb. Can you please extend our grateful appreciation to Grace Romero, the most impressive Anthony Brooks and his grounds team especially Callum Bristow, Frank Siebrecht, who was most flexible and accommodating and Indre Sukiene who gave us a most enlightening tour of the region and for whom nothing was too much trouble. I sincerely hope to be back and will most definitely be promoting the resort as a venue with colleagues, friends and clubs. I felt compelled to drop you a note following your quite magnificent running of the event. You were an absolute star as was your highly committed team – thank you so much. I have been a member for 5 years now during which I have never felt as welcome as I presently do. My guests are already recommending Desert Springs to friends and business colleagues. You were incredibly attentive, professional and above all approachable and kind. I don’t visit often but be assured the next time I do I’ll be dropping you a bottle in. Perfect to go with your family or your partner. The apartments are very good and the food great. All of the staff are very attentive and friendly. In general, very happy, thank you. Venue with a lot of charm! We had great service and a great stay these past days, very attentive staff and good food in the clubhouse, excellent quality price. The pool is great and nice to have it close with the August heat. I’d like to thank you for all your help with the booking and introducing us to Desert Springs. We’ve had an absolutely brilliant vacation – one of the very best we’ve ever had as a family! Desert Springs is a stunning resort with fantastic facilities, but more than that, every staff member we had the pleasure of meeting was courteous, efficient, engaging and thoroughly professional. It’s a really impressive and rare combination that we have really appreciated. The villa itself was exactly the right choice for us and was stunning. I’m not sure if you engage directly with the owners, but if you do, can you pass on our sincere thanks to them as well? I’m not sure I’ve ever written such a glowing endorsement for any holiday I’ve been on so thanks once again, you really helped us have the best vacation. Stayed at Desert Springs in June 2018 in a villa on Desert Drive. Superb location with lovely views over the golf course. Whether you play golf or not does not matter, it’s a great place to stay. As usual the organization was excellent, and the villa well prepared on arrival. Local beaches are a 10-minute drive, but worth driving along the coast to San Juan which has a beautiful beach. Also, worth a visit is Mojacar Pueblo, a traditional white village with great views. I visited Desert Springs with a photography party of 3 photographers and 2 models. We found the villa in exceptional order and the kitchen was fully equipped with everything you need to prepare meals with local produce bought in the local supermarket. The villa, pool, roof terrace and grounds were beautiful and ideal for us photographers to capture stunning images. We visited the Crocodile Club on one evening which had a live band playing. We all enjoyed the bars cocktails on the terrace whilst listening to the band. The staff were all amazing helping us to get settled in on arrival and recommend a few good local restaurants in the town. They spoke very good English which helped with our ropey Spanish. Highly recommended for any trip whether you’re a golfer or not. Another Family holiday at Desert Springs enjoyed by all, 6 Adults and three Children aged 6, 4 & 3. We had a four-bedroom Villa, overlooking the 2nd tee off and the 1st Green, which was equipped to a high standard. We all enjoyed the Pool and lounging in the garden Area. We played golf a few times (and I lost several balls!) on the very challenging but enjoyable course. 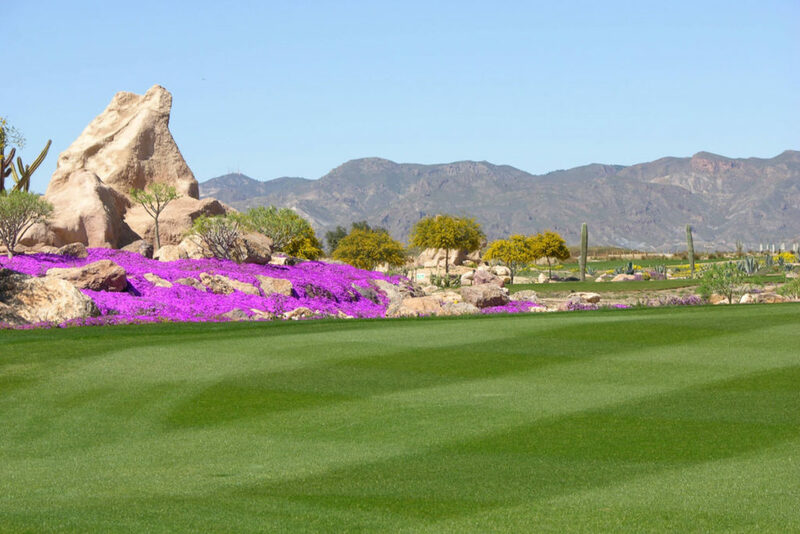 The Staff at Desert Springs are very helpful and friendly, and I would recommend the Clubhouse and Crocodile Club. This is a great place for a peaceful relaxing holiday and only a 15-minute drive from the beach. 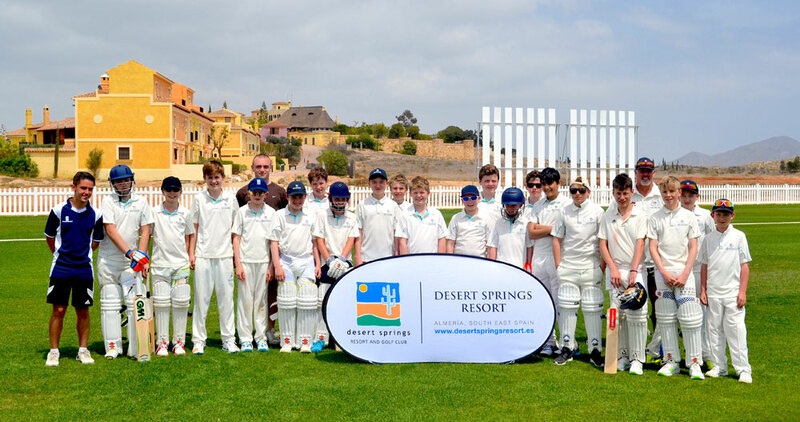 With the domestic cricket season drawing ever closer, twenty (20) members of Abingdon Preparatory School, accompanied by three (3) coaching staff are now back in England having completed a successful 4-day pre-season training camp between Tuesday 17th and Saturday 21st April at the Desert Springs Cricket Ground & Academy. Abingdon Preparatory School Director of Sports Ashley David-Ward, supported by Jamie Ellis, Assistant Coach and Benny Webster, Sports Coach accompanied Twenty (20) players aged 11-12 years of age who completed bowling, batting and fielding practice as well as strength and conditioning training sessions and match simulations on the new cricket ground, as they stepped up their physical preparations for the upcoming 2018 season. “A fantastic experience for all of our boys. The cricket facilities were outstanding as was the accommodation. All of the staff were extremely helpful, and nothing seemed too much trouble! The food was very good and went down well with all of the boys and staff. We will definitely return! 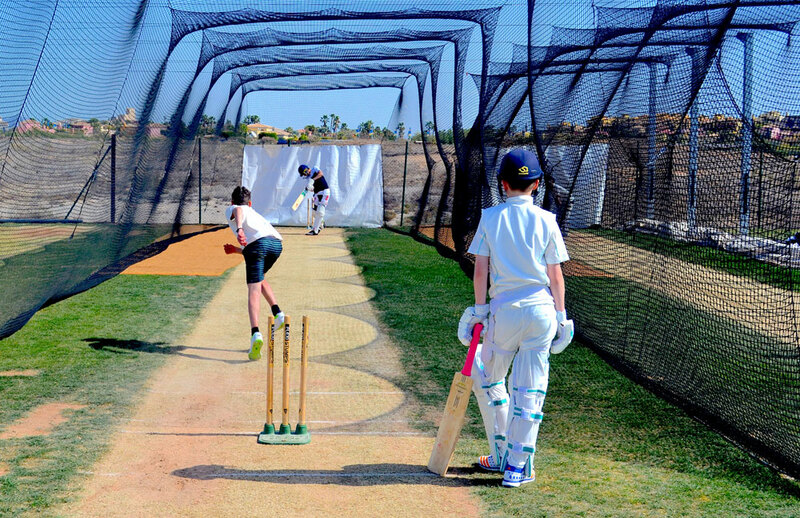 Grass net practice, both bowling and batting took place at the Cricket Academy, along with strength and conditioning work, running, speed and agility work. The squad also benefited from use of the Academy Ground at Desert Springs, incorporating specific practice sessions involving; throw downs, slip catch training and fielding exercises as well as match simulations.